The US Fish and Wildlife Service announced they are listing the lesser prairie chicken as threatened under the Endangered Species Act but landowners and oil and gas companies enrolled in approved voluntary conservation efforts will be exempt from ESA regulations under a special 4(d) rule. 27 March 2014 | Today, US Fish and Wildlife Service has officially listed the prairie chicken as threatened under the Endangered Species Act (ESA) but with a level of flexibility. The Service also finalized a special 4(d) rule that would exempt ranchers, farmers, oil and gas companies and others participating in approved conservation initiatives from the ESA’s regulatory measures. 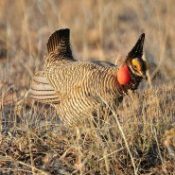 The Service’s conservation plan will rely heavily on the Lesser Prairie Chicken Range-wide Conservation Plan, administered by the Western Association of Fish and Wildlife Agencies (WAFWA). The plan received input from a variety of stakeholders within the bird’s five state range and will continue to function at state level with federal oversight. FWS Director, Dan Ashe, says he’s confident in the plan. The collaboration among stakeholders to conserve the bird voluntarily warranted using the 4(d) rule, Ashe says. Not everyone is satisfied with the plan. Some conservation bankers and others have expressed concern over it. They believe it lacks the rigor to conserve the bird and restore it back to a healthy population. They argue the rangewide plan relies too much on untested methods such as moving habitat, which follows the bird as it migrates instead of conserving permanent swaths of land. “We anticipate that these strategies will have a positive conservation benefit to the lesser prairie-chicken,” Ashe says about moving or shifting mitigation. The plan will monitor these strategies for effectiveness and make the proper modifications if the data indicates they aren’t working, he explains. Ultimately, Ashe says, the entire rangewide intiative is just a plan to conserve the prairie chicken and if it doesn’t work, they will alter the plan. The prairie chicken, which calls the US southern Great Plains states home and is known for an elaborate mating dance, has been in steep decline over the last 100 years with their numbers falling by 50% since 2012. Their native grasslands and prairie habitat in this region has been reduced by 84%, according to FWS. The grouse had been a candidate for listing for nearly 15 years. Today, less than 20,000 total birds remain. The rangewide plan aims to change that. It has set a population goal of 67,000 birds across the range. Other voluntary conservation programs exempt from ESA obligations under the 4(d) rule include the Lesser Prairie Chicken Initiative, developed by the Natural Resources Conservation Service and ongoing agricultural practices done on already cultivated lands. For oil and gas interests, enrollment in the Range-wide Oil and Gas Candidate Conservation Agreement with Assurances earns exemption. The agreements are considered a method to implement the rangewide plan’s conservation strategy. There are other voluntary initiatives being considered by the Service as well. Those aren’t finalized and included at this point but will continue to be considered by the FWS, Ashe says. ESA protection for the prairie chicken will take effect in 30 days after it’s listed in the Federal Register.